These tacos are seriously tasty, but you should make the short ribs even if you don’t swaddle them with tortillas and fixin’s. Effortless to make and irresistible, these gluten free short rib tacos are destined to become a new staple at your table. Combine the vinegar, sugar, 1/2 teaspoon of the salt, peppercorns, and cumin seeds in a lidded jar or plastic container large enough to hold the sliced onion. Shake until the salt and sugar are dissolved. Place the onion in a fine-mesh sieve and pour the boiling water over it into the sink. Add the onion to the jar with the vinegar, then stir or shake to combine. If the liquid doesn’t cover the onion, top with more hot water. Let sit for at least 30 minutes, then use or store up to 1 week in the refrigerator. Preheat a grill to high or a stovetop grill pan over high heat. In a bowl, toss the short ribs with the oil and garlic powder and season liberally with the remaining 1/2 teaspoon salt and a few grinds of pepper. Grill each slice for 2 to 3 minutes on each side, transfer to a cutting board, and let rest for 5 minutes. Cut into bite-size pieces. Warm the tortillas on the hot grill or in a skillet for 30 seconds on each side. Cover the tortillas with a clean, slightly dampened dish cloth to keep them warm. 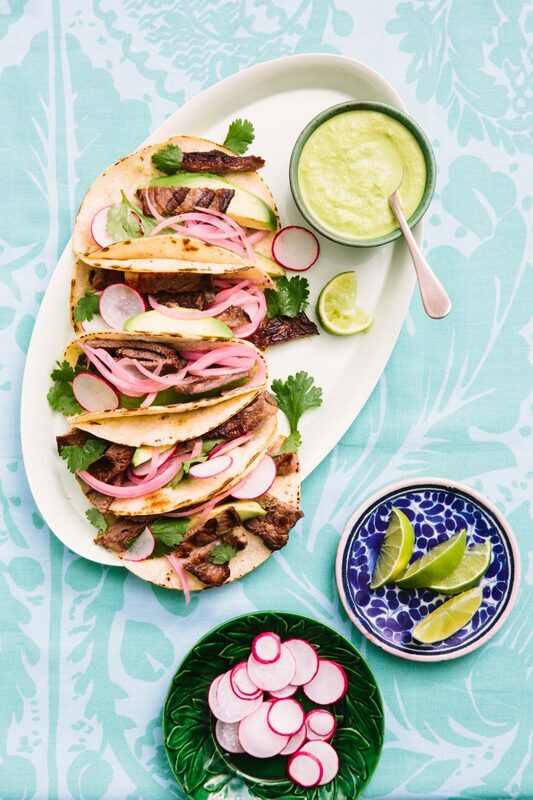 Assemble the tacos: top each tortilla with some short rib pieces, sliced avocado, pickled onion, hot sauce, cilantro, and sliced radish. Serve with lime wedges. MAKES 1 CUP Despite its dairy-free status, this is a surprisingly creamy sauce that keeps well airtight in the fridge for up to 1 week and tastes awesome with eggs or anything else that could use a splash of slightly garlicky heat. For a less spicy sauce, remove some of the seeds from the jalapeños after boiling them. Bring a small saucepan of water to a boil. Add the jalapeños and boil until the peppers just start to soften, about 5 minutes. Drain. In a blender, combine the jalapeños, garlic, oil, and salt. Blend on high until completely smooth. Don’t worry if the sauce is too spicy; it mellows as it cools. Let cool completely before using.